I don’t even know where to start about this place; The “Forte Prenestino” is a military fortress, built in the 19th century, but due to a complete lack of use it was abandoned quite quickly, left to decay and “purposelessness”. In 1986 it was occupied by a group of left-wing students, beginning a year-long work of restructuring it and “giving it back to the people”. Other than being worth a visit for the fort itself, being full of street art and places to discover, the CSOA stands for “centro sociale occupato autogestito”(self-managed occupied social center), what that means is that they stand up for an anti-racist, antifascist, anti-sexist and anti-prohibitionist Rome through political, musical and cultural events, institutions and manifestations, all financed and organized by themselves. I could keep on listing stuff until infinity at this point, but the best thing is to just check out their website and/or their FB-page where you can find all the information on their swanky activities you need. 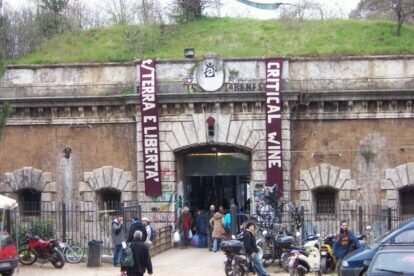 The Forte Prenestino is in the “Centocelle” neighbourhood and you can get there by taking the trams 5 or 19, getting off at Via Delpino.